It can be hard to wrangle kids' attention during the Halloween season, but it will be a piece of cake with this fun activity! 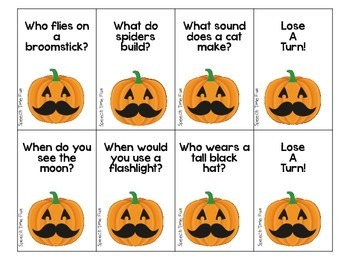 Target WH- questions with your students while celebrating Halloween with this fun jack-o-lantern theme! 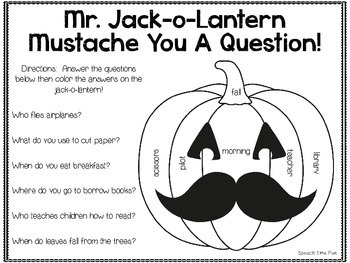 Plus, you can add your own mustaches! What goals are targeted by this product? ★ Students should take turns picking a card. ★ They must answer the question on the card. ★ If they pick the “lose a turn” card, they must lose a turn. ★ Students can hold onto their cards once they respond to questions correctly. ★ The student with the most cards at the end of the game is the winner. "This was so much fun! 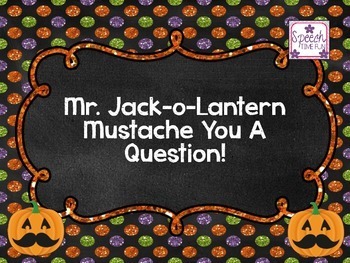 It kept my students' attention and interest even during the hype of Halloween!" "My students will love having some new "Wh" questions to work on in therapy with this fun seasonal theme! I appreciate the review/homework sheet you included!" "Fun! I can't wait to try it with the stick-on mustaches I got at the $1.00 store!"